We had a pretty good feeling Roku was cooking something up when it filed paperwork with the FCC last month, and, as we’d hoped, Roku just pulled the curtains back on its new $99 Roku 3 media streamer. Roku promises that the 3 is the media streamer to rule them all. The box now offers more than 750 channels (including the newly-added FOX NOW, PBS and PBS Kids, which are due to launch soon), a speedier processor for snappier search and navigation, a brand new user interface and a remote outfitted with a headphone output. This is all great, but where’s the built-in support for YouTube? Roku’s new interface maintains the simplicity that Roku is known for while providing improved access to channels thanks to a grid system that displays more options at once. And the fully integrated Roku Channel Store and one-stop search helps viewers easily pinpoint what they want to watch and get there instantly. As a bonus, this new interface will automatically roll out as a free software update in April to all current-generation Roku devices, including the Roku LT, Roku HD (model 2500R), Roku 2 HD, Roku 2 XD, Roku 2 XS and the Roku Streaming Stick. The Roku 3 enhanced remote features a built-in headphone jack with volume buttons for private listening – a handy feature for those times when turning up the TV speakers will land you in trouble. Roku tosses in a pair of earbuds, but we’re pretty sure most aftermarket headphones will sound better. Additionally, the remote doubles as a motion-sensing game controller for playing games like Angry Birds Space. The Roku 3’s rear panel features an HDMI output, microSD slot, USB port, 10/100 Base-T Ethernet jack, and power jack. Users get up to 1080p HD video, 7.1 and 5.1 digital audio via HDMI and access to MP4 and MKV video, and AAC, and MP3 audio files via USB. Those without Ethernet running through their homes will appreciate a new dual-band WiFi adapter with support for support for a/b/g/n protocols. While the Roku’s channel selection is best in class, and even more features and content are available with simple mods, it is a disappointment that it doesn’t appear we can expect a native YouTube app anytime soon. Apparently competing with Google TV has its disadvantages, as it would seem hardware capability isn’t the reason a YouTube channel remains absent. That’s a tough break for Roku, since just about every other streaming media platform does. 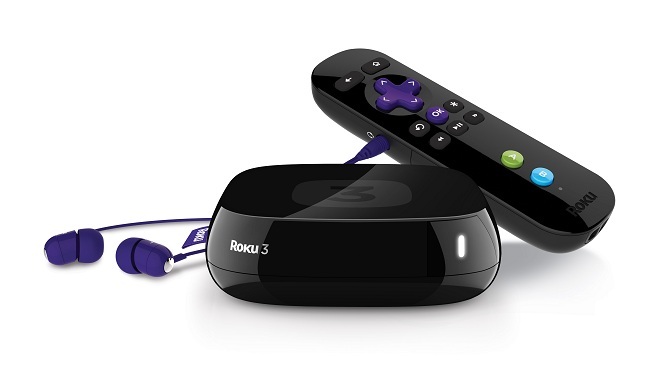 The Roku 3 is available now at Roku’s website and at Amazon. 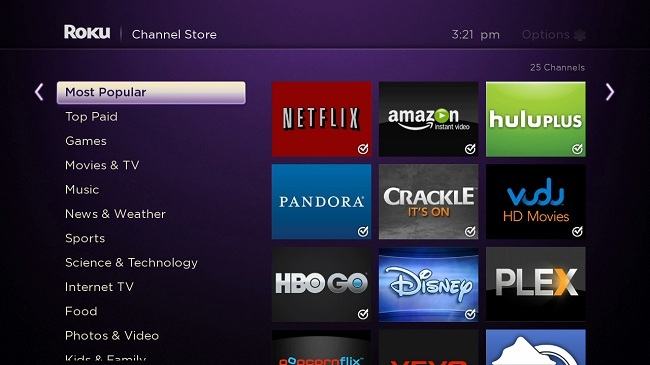 Retail stores will not begin stocking the Roku 3 until April.